With an expanded service profile, DP World Subcontinent is refocusing on efficiency to sustain its market-leading position at Jawaharlal Nehru Port Trust (JNPT), India’s busiest container harbor. 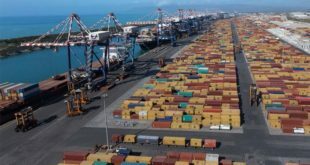 DP World said that its “futuristic” NhavaSheva (India) Gateway Terminal (NSIGT) registered a new productivity high, as the terminal gears up to handle the first call from a large size, seven-vessel India-Mediterranean loop on Wednesday (28 November 2018). Officials said NSIGT last week generated average gross berth productivity of 155.08 moves per hour when it serviced the Maersk Genoa. 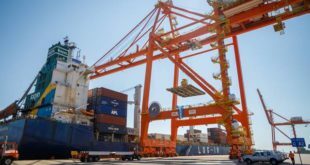 Further, the terminal conducted 2,850 container moves, or an impressive 4,500 TEU lifts (exports/imports) from a single call, during its 20-hour stay at berth. That stellar performance was an improvement on the previous best of 146.54 moves per hour achieved during the MSC Topaz call Oct. 22, officials said. “This is a result of the excellent all-round operations by the team and the state-of-the-art technology, which has enabled the terminal to log higher productivity and operational efficiencies,” the company said. The Maersk Genoa is one of eight vessels deployed in the ocean carrier’s independent, weekly Europe-Middle East (ME1) Service. The ME1’s ports of call are as follows: Jebel Ali, United Arab Emirates; NhavaSheva (JNPT) and Mundra, India; Salalah, Oman; Jeddah, Saudi Arabia; Port Tangier, Morocco; Felixstowe, United Kingdom; Antwerp, Belgium; Hamburg, Bremerhaven, and Wilhelmshaven, Germany; and Rotterdam, Netherlands. 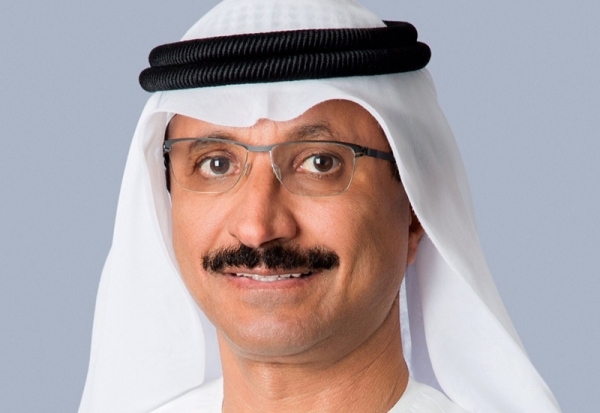 DP World has lately prioritized operations at NSIGT, as part of a strategic, internal commercial adjustment, in the wake of long-running tariff complications at its older/flagship NhavaSheva International Container Terminal (NSICT). 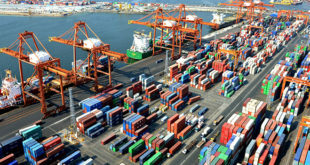 As a result, NSIGT has increased the number of its weekly/regular calls to seven, including the aforementioned India-Med loop between Mediterranean Shipping Co., CMA CGM, and Cosco Shipping Lines, as well as the Indamex Service in the India-North America trade, which began regular calls there in March. 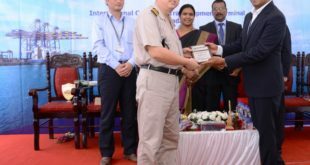 Additionally, NSIGT has achieved a raft of “firsts” to its credit at JNPT: the largest-ever container ship call at an Indian port, with the 13,000-TEU MSC Cristina berthing in April 2017; an advanced, optical character recognition (OCR) technology-based gate solution; and a seamless, 110-ton breakbulk/oversize cargo operation on a recent MSC container vessel. That competitive edge, combined with a trade-centric approach, are among the main reasons for ocean carriers’ increasing interest in NSIGT, as they navigate through tough market conditions beset by excess tonnage and low rates on major trade lanes. With a berth length of about 1,083 feet, a 44-foot draft, a 68-acre storage yard, four rail-mounted quay cranes, and 12 rubber-tired gantry cranes, NSIGT has a capacity to handle 1 million TEU per year.